As shown in the figure below, the 2,459 acre Jordan/Alder Creek Watershed begins at Tellurium Peak and flows directly into the South Umpqua River downstream from the City of Canyonville, Oregon. The Jordan/Alder Creek drainage is southwest of Interstate 5, and flows through the Cow Creek Band of Umpqua Tribe of Indian's Creekside Development Project. 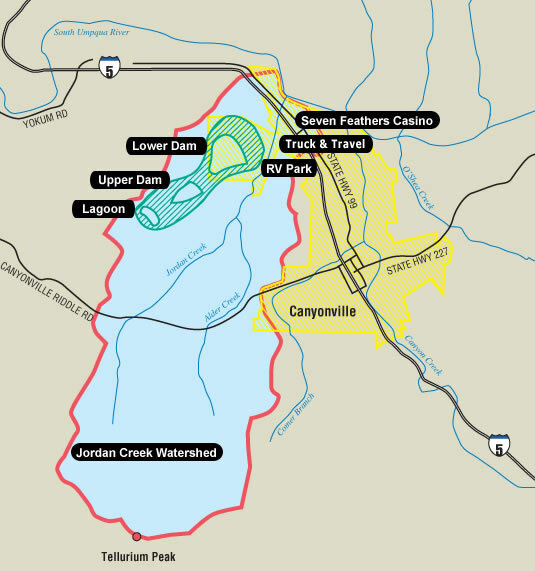 In 2005, the Tribe received a grant from the Bureau of Indian Affairs Watershed Restoration Program to conduct a Jordan/Alder Creek Watershed Assessment (11 megabyte download). The Assessment was completed in 2006. Continue riparian planting using native species. Create settling ponds and off-channel habitat. Monitor water quality of the system. 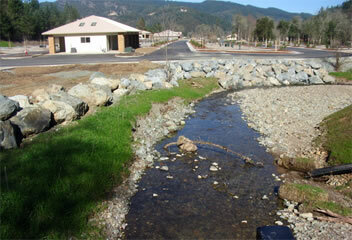 drainage to restore Jordan and Alder Creeks. Working with the Oregon Department of Fish and Wildlife on Steelhead and Salmon acclimation. 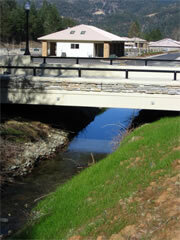 Public educational tours on native species and fish restoration.